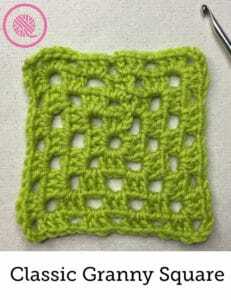 No beginner crochet class is complete without learning how to crochet granny squares. The granny square is as timeless as it is beautiful. It can be made in any size with any yarn to fit any style. I’ve included two styles of granny squares in this series. The classic granny square feels light, airy and open with alternating blocks and eyelets while the solid granny only has eyelets at the diagonals of each round so it makes a more stable square. We’ve got to start with the classic granny! Can’t you just feel the history and nostalgia from seeing a granny square project? Although you can still crochet granny squares out of scrap fabric to make an afghan granny squares are making a comeback in a variety of ways. You may be thinking, “I don’t really want to make a granny square afghan.” Once you know how to make some simple granny squares you can transform them into almost anything. Purses, totes, slippers, sweaters and so much more. I created a Pinterest board with a variety of granny square projects to spark your creativity. Granny Square Projects! If you need to review the basic stitches, go back and check out the beginning of the series: How to Crochet: Basic Stitches. Ch 4. Slip stitch into the 4th chain from the hook to form a ring. Round 1: Ch3, 2 dc into center circle. Ch3. *3 dc, ch3 into center. * Repeat from * to * two more times. Join with sl st to the 3rd stitch of beg chain. Round 2: Ch4, (3 dc, ch 3, 3 dc) in corner. Ch1. *(3 dc, ch3, 3 dc) in corner, ch1. * Repeat from * to * once. (3 dc, ch3, 2 dc) in last corner. Join with sl st to the 3rd stitch of beg chain. Round 3: Ch3, 2 dc in ch 1 space. Ch1. *(3 dc, ch3, 3 dc) in corner, ch1, 3dc in ch 1 space, ch1. * Repeat from * to * two more times. (3 dc, ch3, 3 dc) in last corner, ch1. Join with sl st to the 3rd stitch of beg chain. Round 4: Ch 4, 3 dc in next ch 1 space, ch1. *(3 dc, ch3, 3 dc) in corner, ch1. [3 dc in ch 1 space, ch1.] Repeat instructions in [ ] until next corner. * Repeat from * to * two more times. (3 dc, ch3, 3 dc) in corner, ch1, 2 dc in ch 1 space. Join with sl st to the 3rd stitch of beg chain. Round 5: Ch3, 2 dc in ch 1 space, ch1. *[3 dc in ch 1 space, ch1.] Repeat instructions in [ ] until next corner. (3 dc, ch3, 3 dc) in corner, ch1. * Repeat from * to * three more times. [3 dc in ch 1 space, ch1.] Repeat instructions in [ ] until end of round. Join with sl st to the 3rd stitch of beg chain. Repeat Rounds 4 and 5 until your granny square is the size you desire. Watch the video below to learn how to crochet the Classic Granny Square! 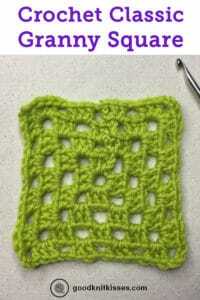 Go the next page for Lesson 7: How to Crochet Solid Granny Square! 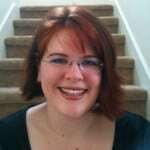 Kristen is a multi-talented entrepreneur with a heart as big as Texas. She is the Owner, Host and Creative Director of GoodKnit Kisses. GoodKnit Kisses is a company positioned to inspire, encourage and empower people through education and design. She’s built a large and loyal on-line community of followers by sharing her personal passion for knitting and all things creative through YouTube video tutorials, Facebook live broadcasts, blogs and patterns. Her vision is to leave an inspired crafting world for future generations that continues to teach and reach others. She and her husband, John, have three amazing kids. Yes, I'd like to join the GoodKnit Kisses email list and receive updates on new content.